At University Dental Associates in Bryan, TX, Dr. Michael Kramr and Dr. Brian Spence provide the latest in dental implants and restorative dentistry technology. Dental implants are artificial tooth roots that serve as anchors for replacement teeth. When a patient is missing one or more teeth, dental implants are the most permanent (and often the most comfortable) solution. Visit our smile gallery to view some before-and-after photos of the results enjoyed by dental implant patients. The first step in the dental implants process for our Bryan dental patients is a consultation with Dr. Kramr or Dr. Spence, during which all possible tooth replacement options will be discussed. To be a good candidate for dental implants, the dental patient must have sufficient bone in his or her jaw to support the implants. 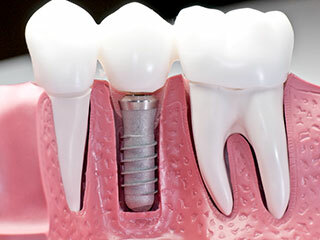 Once it is determined that the patient is a good candidate for dental implants, the doctor will surgically implant the titanium screws that serve as anchors into the patient's jaw. The next step in the dental implants process will occur three to six months later, after the titanium tooth roots have completely fused to the patient's jaw bone. Once this has occurred, the patient can return to our Bryan restorative dentistry office where Dr. Kramr or Dr. Spence will fit the custom-crafted replacement teeth onto the patient's artificial tooth roots. Many of our Bryan area dental implant patients prefer permanent dental implants over traditional removable dentures for several reasons. Dental implants are nearly indistinguishable from a patient's natural teeth, unlike dentures which look artificial. While traditional dentures need to be removed nightly for cleaning, dental implants are a permanent tooth loss solution that require no additional maintenance outside of a good oral hygiene routine. Dental implants also allow patients to feel more comfortable while speaking and eating because dental implants are permanently affixed to the patient's jaw and won't shift or slip as with traditional dentures. If you are interested in learning more about your tooth replacement options, especially dental implants, contact our Bryan office at (979) 846-0353 (call or text) to schedule your restorative dentistry consultation with Dr. Michael Kramr or Dr. Brian Spence today.